Namibian and Chinese government officials announced the construction of a new uranium mine in the country during a groundbreaking ceremony April 19. Construction of the Husab mine in the western Erongo region will cost of about $129 million and will be finished sometime in 2014. The first production batch of uranium ore is expected by 2015. The future mine, which is located 60 kilometres northeast of Swakopmund, has at least 142,000 tonnes of uranium resources in-situ with an average grade of roughly 0.04% that could be mined for more than 20 years. Full production is expected by 2017, with mining from two separate open pits feeding ore to a conventional agitated acid leach processing plant. 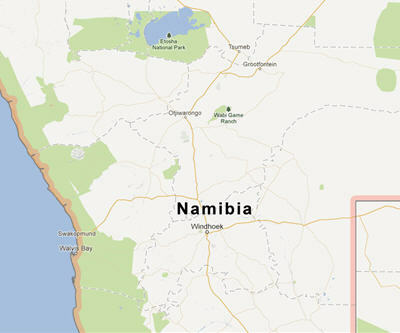 Namibian state mining company, Epangelo Mining, owns 10% of the Husab project while Chinese state-owned China Guangdong Nuclear Power Holding Corp. is a major owner with 90% interest. With nameplate production capacity of 5,560 tonnes of uranium per year, Husab mine would potentially be the third largest uranium production facility worldwide, slightly behind the McArthur River and Cigar Lake mines in Saskatchewan. China Guangdong Nuclear Power Holding Corp. bought the Husab project from the Australian-listed mining firm Extract Resources last year for nearly $1.9 billion. Reportedly, the uranium from the Husab mine will be one of the largest sources of fuel for China's highly ambitious nuclear power construction program. Full information about opening ceremony could be found here.